The quickest and easiest way to donate to CFSC is by using the form below. To become a monthly donor via automatic withdrawals from your bank account, please fill out this sheet and mail it to us together with a void cheque. All information remains confidential, and changes can be made anytime, hassle free. 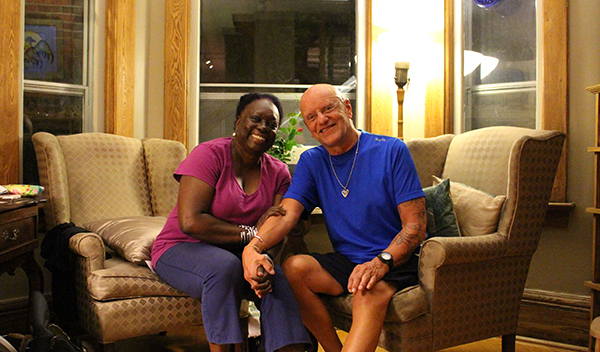 Monica and Jeffrey, long-time donors in support of CFSC’s work for justice and peace. Canadian Friends Service Committee is a Registered Charity (number 13214 6549 RR0001). Charitable receipts are issued for donations over $10. For more information, visit the Canada Revenue Agency listing for Canadian Friends Service Committee. Stocks and bonds enjoy significant tax benefits over cash donations. You can have your broker contact us to arrange a donation of securities or you can donate securities online. Did you know that in a given year gifts left in wills, called “bequests”, make up as much as 49% of the donations CFSC receives? It’s hard to overstate just how meaningful these gifts are. None of the peace and social justice work described on this site would happen without donations from committed individual donors. Bequests are a huge part of this. Many donors choose to leave a bequest to CFSC when they want to leave a lasting legacy. A “residual” bequest is particularly popular. It is a gift of what is left over after all fixed financial obligations have been dealt with. A residual bequest lets you leave all or a percentage of the remainder of your estate to CFSC. For example, you could leave a certain amount to each child and grandchild and then, after other specific items, fees, and taxes have been paid, whatever remains can be left to CFSC. A “residual bequest subject to life interest” is very similar but includes a clause that CFSC is the ultimate beneficiary after other beneficiaries have had use of the income from the estate during their lifetimes. Finally a “specific bequest” is a clause in your will that leaves a specified asset or amount of funds to CFSC. This information is general. We encourage you to consult a lawyer in the preparation of your will to ensure the specific wording used is appropriate to your intentions. Questions? We would be happy to help. Our office is usually open 9 am to 5 pm on weekdays and we do our best to respond promptly to all inquiries.